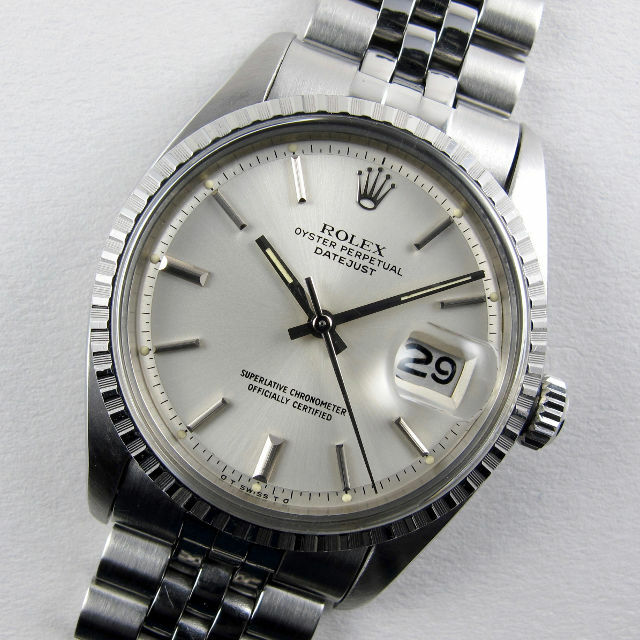 Opening this week’s newsletter is one of the iconic, vintage, Rolex Datejust models. This example has a superb, silvered, ‘sigma’ dial. So-called ‘sigma’ dials were introduced in the 1970s and are named after the use of the Greek letter which appears at the base of the dial to either end of the ‘Swiss’ graphic. These ‘sigmas’ indicate that the applied numerals to the dial are made from gold. Since numerals/indexes on watch dials are often either punched out from the dial’s surface or applied with a plated finish, the ‘sigma’ sign was a useful way to indicate when gold was used and thereby highlight the quality of materials used. The dial has a lovely, silvery grey, satin sheen and a chamfered outer minute/seconds track which creates a two-tone appearance and gives a greater sense of depth to the surface. The luminescent dots remain full and there is good and even colouration both to these and the luminescent panels to the hands. Next is a mid-sized Rolex Oyster Speeding which has a silk-matt silvered dial that retains an excellent lustre to the surface. There are raised baton hour indexes with matching hands and a contrasting, blued steel, centre seconds. 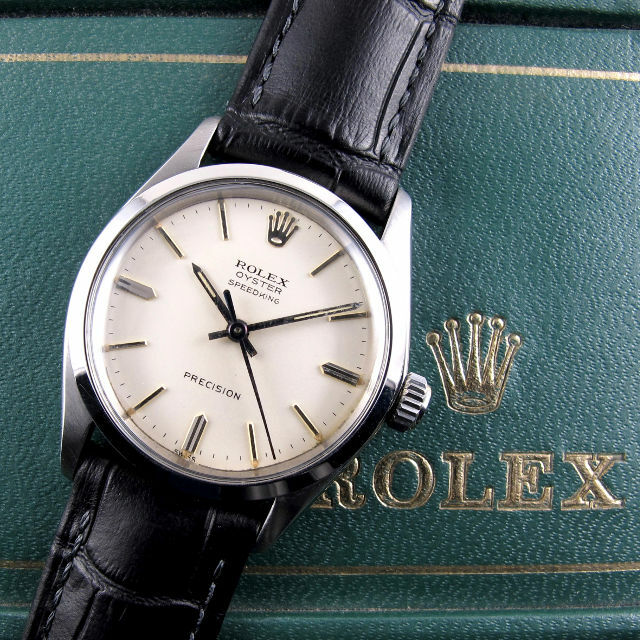 The classic Rolex Oyster case has a smooth, chamfered bezel and typical screw-down crown and case back. This watch is accompanied by a green Rolex fitted presentation case. 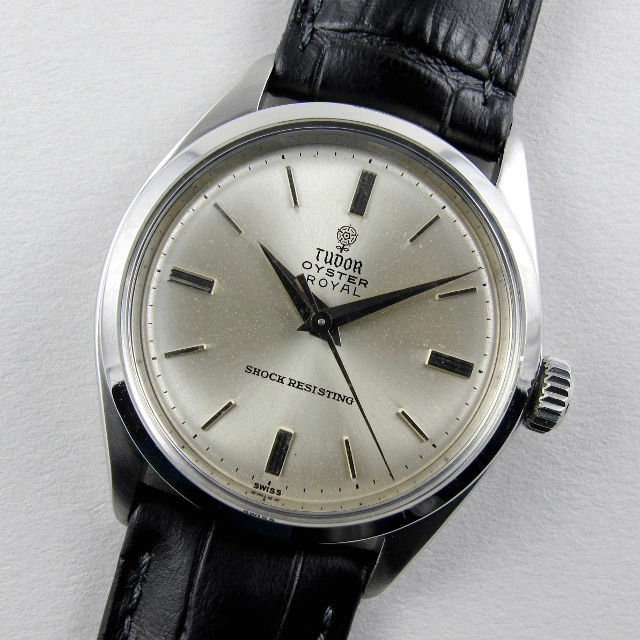 Also date stamped for 1963, this is a classic example of the Tudor Oyster Royal with a great monochrome look. The watch has a smart silvered dial with raised baton indexes and dauphine hands. The robust, stainless steel, Oyster case has the typical screw-down Rolex crown and case back. A handsome example of the 131.019 model, this watch is accompanied by its original numbered guarantee booklet noting a date of sale in March, 1971, at H. Pidduck & Sons, Southport. The watch also retains its red plastic Omega document wallet, further Omega booklet and red Omega presentation case. 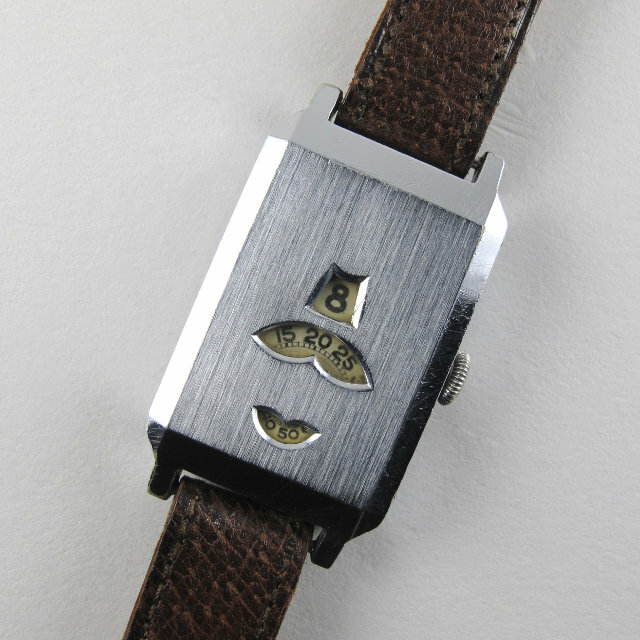 The dial of this watch has a very attractive and unusual, block style, Arabic numeral configuration – the majority of examples of this model were produced with straight baton indexes. There is some light oxidation to the surface of the dial. 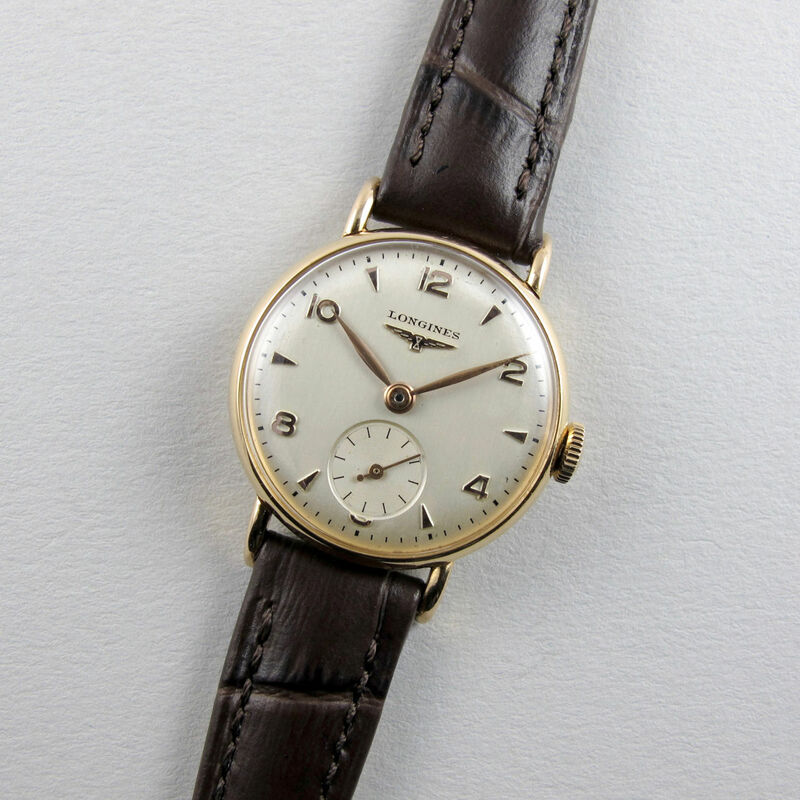 This smart Longines wristwatch has a solid 9ct yellow gold case. The silvered dial is in good original condition with a bright, satin finish and there are applied gold Arabic and baton hour indexes. 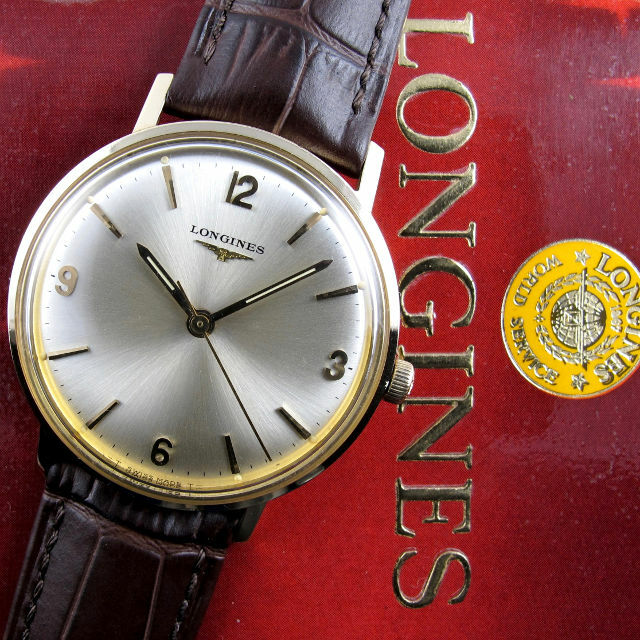 The watch retains its original, numbered, Longines guarantee booklet, fitted presentation case and gilt metal buckle which has the embossed, winged, Longines logo. 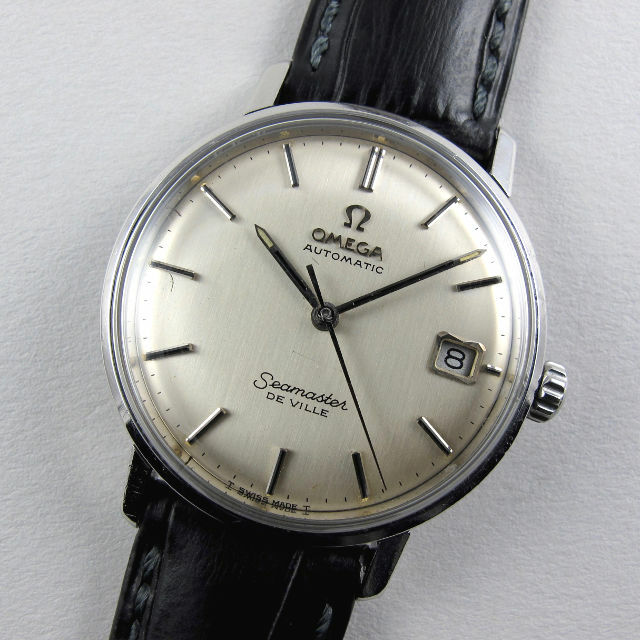 Omega first introduced the 166.020 model in 1962 and their double ‘branding’ of the model as a Seamaster ‘de Ville’, emphasised the watch’s sporty nature (for which the Seamaster models were well-known) whilst also drawing on the watch’s classic, dress-style look which the ‘De Ville’ range was introduced to represent. This example of the model has a classic, light silvery grey finish to the dial and there are applied baton indexes and black inserts. 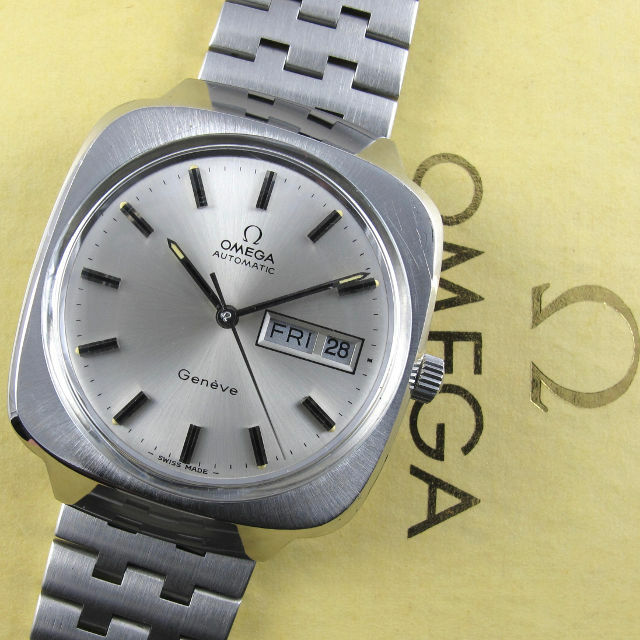 The watch retains its signed Omega crystal and crown. The dial has a good lustre and there are some small scratches to the surface of the dial. Automatically wound via the calibre 565, the movement also has provision for quick date change. When the crown is pulled out to the second position, the date flips forward, thereby allowing easy advancement when required. 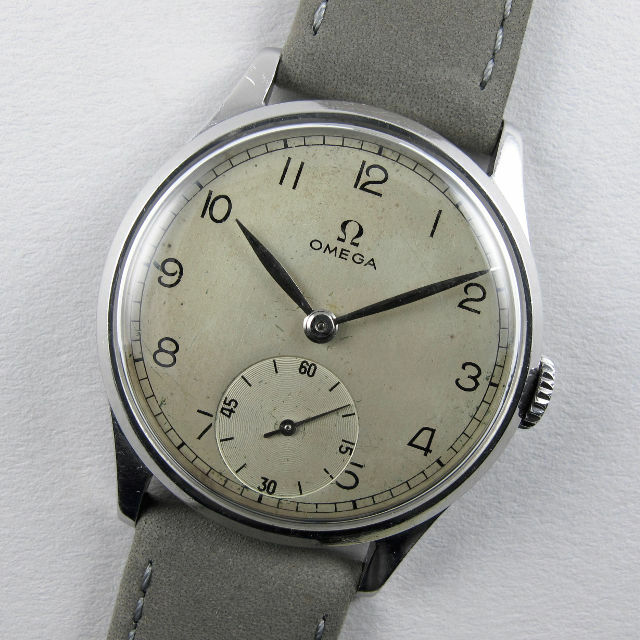 This steel Omega wristwatch has silvered dial with slim, black, Arabic numerals. Manually wound, the movement is a 30T2 PC which is one of the earliest members of Omega’s famous and highly regarded ’30’ series calibres. The characterful dial appears to have been sympathetically and very well restored at some point in the past – the subsequent ageing would suggest that this was many years ago – the dial has since acquired a light patination and there are some small scratches and oxidation spots. Jump hour or ‘digital display’ wristwatches quickly gained in popularity during the first half of the 1930s. The movement of this watch is a patented variant of Fontainemelon’s calibre 29. To achieve the ‘digital’ display, Fontainemelon modified their top plate with additional bridge work, thereby allowing slightly recessed discs to be mounted in place of hands to the top of the movement. Although the discs for seconds and minutes are continually moving, the disc for hours is additionally geared so that it satisfyingly ‘jumps’ from one hour to the next. A very handsome examples of a jump hour model, this watch is accompanied by an H. Samuel’s retailer’s presentation case. This wristwatch has an 18ct yellow gold case which has a lovely, rich, tone. A very attractive mid-century lady’s wristwatch, the silvered dial has a classic configuration, with raised Arabic and triangular hour indexes. Manually wound, the watch is powered by Longines’ calibre 8.68N with 17 jewels. 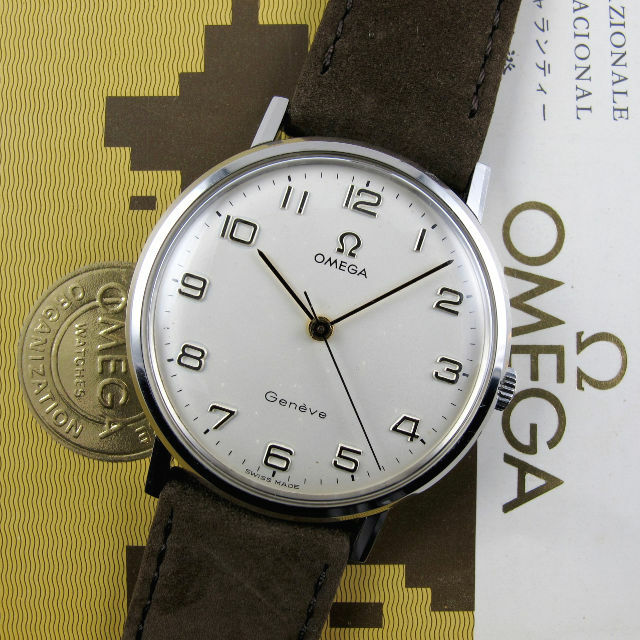 This large sized Omega wristwatch has a substantial cushion form case which incorporates unusual, polished and angled, hooded lugs. Automatically wound via the calibre 1022, the crown is equipped with two settings – when the crown is pulled out to its first setting, the date can be moved either forwards or backwards by rolling the crown in either direction; by pulling the crown out to its second setting, the hack feature engages, thereby stopping the seconds hand to allow accurate synchronisation to a time signal, rolling the crown towards the wearer advances the hands, rolling away advances the days of the week in tandem with reverse hand setting. The watch has an Omega signed crystal and crown and is fitted with its original, detachable, Omega steel link bracelet with adjustable folding clasp. Accompanied by a red Omega presentation case and outer card box. 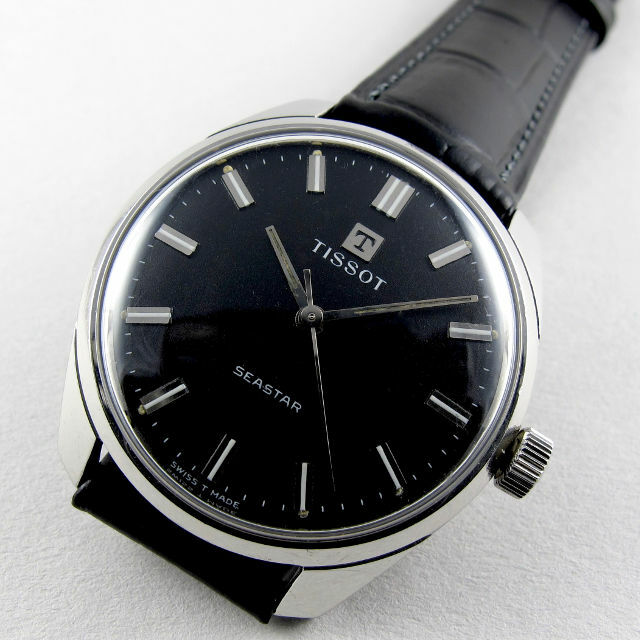 This Tissot wristwatch has a handsome, matt black dial. The chunky, cushion-form case is typical of late 60s and early 70s designs. Manually wound, the watch is powered by the Tissot calibre 781/1. To automatically receive these updates via email, please select the ‘Join our Mailing’ list tab at the bottom of any of our web pages.